The coming few weeks offer some great programming on the antenna TV schedule, including comedy, period drama and big sporting events. If you want to view and record free, over-the-air antenna TV on multiple TVs in your home, you may want to buy a Tablo DVR . Combine Tablo with an HDTV antenna and an external USB hard drive , and you’ll have a whole home DVR for catching everything you want to watch on the antenna TV schedule. Here are a few things you’ll find to watch on antenna TV in the coming weeks. Whose Line Is it Anyway? (Improv Comedy), The CW, Fridays at 8:00 and 8:30 p.m.
“Whose Line” might be the funniest show ever invented, and it’s been popular enough for several incarnations. It started in the U.K. and ran for 10 seasons, ending in 1998 when ABC began showing it in the U.S. 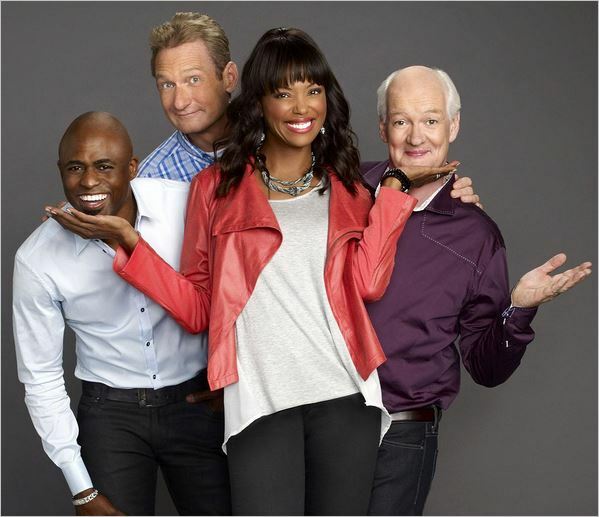 The U.S. version, hosted by Drew Carey, retained many of the same talented improv comedians, including regulars Colin Mochrie and Ryan Stiles and quickly adding Wayne Brady as a third regular. In 2013, the CW resurrected the show with the same regular cast members and a new host, Aisha Tyler. The current iteration of “Whose Line” uses celebrity guests instead of audience members as previous versions did. A rotating panel of guest comedians complete the four-member improv team for each show. The cast members participate in “games” in which the host provides a topic and they need to make up something to go along with it. Wayne is often asked to sing a song about a celebrity guest using a certain style or impersonating a particular artist. “Weird Newscasters” has the players taking on strange personas while doing the news, sports and weather. “Let’s Make a Date” has the three main players pretending to be certain types of dating show contestants while the guest comedian tries to guess who or what they are pretending to be. If you’ve never watched “Whose Line,” you’re missing a hysterically funny show. The sketches are also completely real and unscripted but for the topics provided to the improvers. The cast makes up everything off the tops of their heads, with hilarious results. Downton Abbey (Masterpiece Classic), PBS, Sundays, 9:00 p.m.
You can watch the early 20th century period drama “Downton Abbey” on antenna TV or through the PBS app on your Roku or other TV streaming player. The show follows an upper class British family, along with their household staff, shortly before, during and after World War I. New episodes from the fifth season began on January 4. The main characters are the earl and his American-born wife, their grown daughters and several key members of the household staff. So far during the series’ highly popular run, the youngest of the three daughters fell in love with the chauffeur, married him, had a baby and died in childbed. Her devastated widower, Tom, works in a high-level position managing the earl’s estate and continues to live with the family along with his young daughter. A big part of the first three seasons was the love story of the earl’s oldest daughter, Mary, and his heir, a distant cousin named Matthew. Not too long after the two finally married and had a baby, Matthew was killed in a car accident at the conclusion of season three. During season four, Mary began moving on and dating other men. The middle daughter, Edith, fell in love with a married man who later disappeared shortly before she found out she was pregnant by him. She left the country to have her baby and ended up leaving the baby with a local farmer’s family where she could still see her. There are way too many past and continuing plot lines to describe fully here, but you can watch all four seasons of Downton Abbey on Amazon Instant Video free with your Amazon Prime membership. Even without a pay TV subscription, you can watch the upcoming Super Bowl on antenna TV. You can also catch the Super Bowl, Pro Bowl and playoff games in several other ways. Some local stations run “Antenna TV” as one of their secondary digital channels, and one of the best old shows on Antenna TV is the Burns & Allen show from the 1950s. The real-life married couple moved from vaudeville to radio to TV with their act, with George Burns as the straight man and Gracie Allen playing his ditzy wife, though, as with many comedians who play dumb, she was actually a highly intelligent person. I read George Burns’ 1991 biography of Gracie Allen, “Gracie: A Love Story,” many years ago and was touched by his obvious affection and admiration for his wife, who died in 1964. Burns, who died at the age of 100 in 1996, never married again. Even though their show originally aired many years before I was born, I find it more entertaining than many of the current TV show options. Another hilarious classic comedy picked up by Antenna TV is this 1970s show about the colorful characters employed by a fictional Cincinnati radio station, including disc jockeys Dr. Johnny Fever and Venus Flytrap and secretary Jennifer Marlowe (played by Loni Anderson). Check out WKRP if you’re looking for some fun, lighthearted comedy to take your mind off your troubles. What are your favorite shows to watch on antenna TV? Be sure to check out some of my other Roku articles here. If you enjoyed this article, please click here to give it a G+1! Kindle Unlimited: $9.99 a month for an all-you-can read buffet of free Kindle books!